Millions of Americans are driving vehicles with defective Takata airbags that can shoot metal shrapnel at the vehicle’s driver and passengers when deployed—— causing severe lacerations, loss of vision and even death. So far, several automakers have recalled at least 50 million airbag inflators (the largest automotive recall to date) due to the volatile chemical propellant, ammonium nitrate, which is used to inflate an airbag when a deployment signal is received. Takata used ammonium nitrate as the primary propellant for its airbags, which can become unstable over time or when exposed to moisture or extreme heat. This chemical instability causes a violent eruption during the airbag’s deployment that shatters the airbag inflator module, shooting jagged, metal shrapnel at the driver and passenger’s face, neck and chest. These defective airbags have killed at least 23 people and injured hundreds more worldwide. The airbag is supposed to be a safety feature, designed to protect occupants in the event of the crash, but Takata airbags are putting people into a potentially lethal situation. 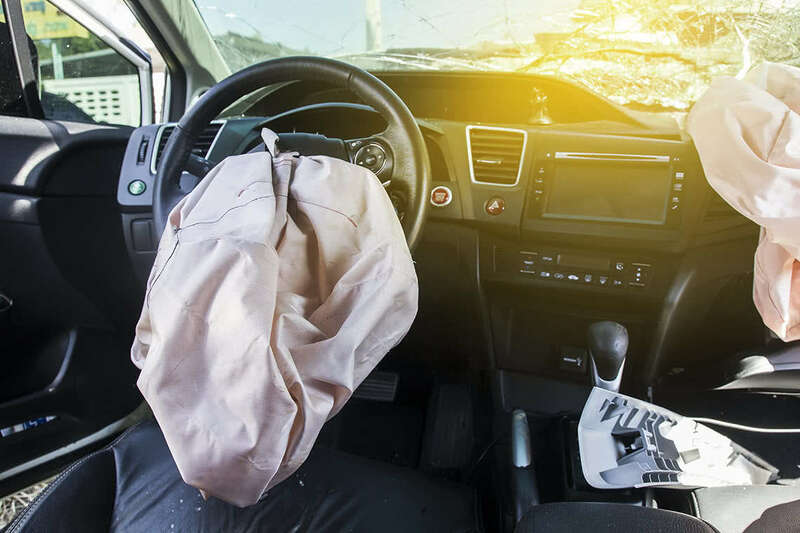 Despite the recent bankruptcy of Takata’s US based subsidiary, TK Holdings, Inc., there are three potential avenues for Takata airbag victims and future claimants to recover compensation for their Takata airbag injuries. To learn which vehicles are among the millions of those recalled, what to do if you own one of those vehicles, and how you may be able to claim compensation if you were injured, please review the below. If you or someone you know sustained lacerations that required stitches, hearing loss, a brain injury, broken bones or a skull fracture, loss of vision, nerve damage, or was killed in an accident involving a deployed airbag, do not hesitate to contact us today. Our lawyers may be able to help you hold Takata and the auto manufactures responsible for medical bills, pain and suffering and other losses. To discuss your legal options with someone at our law firm, call 844-679-4859 or fill out this form and we will get back to you as soon as possible. What’s the Problem With the Airbags? Over time, the propellant responsible for triggering inflation during a crash can deteriorate or become unstable, especially in states with high levels of humidity, including but not limited to Florida, Georgia, Alabama, Louisiana, Texas and Hawaii, according to the recalls. In the event of a crash, the unstable propellant can rupture the metal inflators in the airbags and shoot metal pieces or shrapnel into the vehicle’s cabin, putting drivers and passengers at risk of serious injuries or death. How do I Know if My Vehicle Has Takata Airbags? You can check to see if your vehicle is subject to the recall by entering your VIN here. If your vehicle is on this list and you or a loved one was seriously injured after the airbags deployed, you may be able to file a lawsuit against Takata. I Was Injured by My Airbag: Can I File a Takata Suit and Claim Compensation? Takata Airbag Individual Restitution Fund: This fund was ordered by the Federal Court in the Eastern District of Michigan as a result of TK Holdings, Inc.’s criminal guilty plea for fraud. The fund contains $125 million for people who have suffered or will suffer personal injury or wrongful death due to a defective Takata airbag inflator and who have not previously resolved their claims against Takata. Takata Bankruptcy Trust: This trust was created as part of TK Holdings, Inc. bankruptcy plan for the benefit of personal injury claimants. The trust is for those previously injured by a Takata airbag and for future victims. The fund’s estimated value is $90 million to $137 million, although that amount may increase, but will not decrease. The trust should begin accepting claims in approximately mid-2018. Participant Original Equipment Manufacturer (“POEM”) Fund: So far, only those individuals who have been injured by a Takata airbag within a Honda or Acura vehicle are eligible for compensation from this fund. Honda vehicles caused more injuries and deaths than any other of the car manufacturers combined. Through this fund, those previously injured by a defective Takata airbag and those victims who will suffer injuries from a Takata airbag may receive compensation. Morgan & Morgan attorney Andrew Parker Felix was recently appointed as one of three members for the Trust Advisory Committee (“TAC”). The TAC will represent the interests of those individuals with Takata airbag claims, coupled with administration of the three funds. The TAC members were selected along with the Special Master, Eric Green and the Future Claimants’ Representative, Roger Frankel, to represent the interests of those victims with current and future personal injury and wrongful death claims related to a Takata airbag. Each case is different, however, and the type and amount of compensation you could recover will vary depending on a number of factors, including your relationship to the deceased. Our attorneys only collect a fee if they successfully resolve your case. If so, they will receive a portion of the final settlement or jury verdict. If you or a loved one suffered serious injuries after your vehicle’s airbag deployed, don’t hesitate to contact us today. It’s important that you speak with a Morgan & Morgan products liability attorney as soon as possible to ensure that your legal rights are protected and you don’t lose out on the opportunity to receive compensation for your Takata airbag injuries. Morgan & Morgan lawyers Andrew Felix and Mike Morgan are handling these cases nationwide. For more information, call us at 844-679-4859 or fill out this form.